Bounceland UK were hired to provide soft play for my sons 1st birthday party. The soft play and bouncy castle were simply amazing.There were 13 very happy little infants who absolutely loved it. I was very impressed as the bouncy castle was spotlessly clean, safe and was ideal for 1 year olds. I also loved how it was just a little bit different to standard bouncy castles and provided more enjoyment for the little ones.The soft play set was also immaculate. The children also loved the little inflatable animals that came with the package. There is only one company I'll use for parties in the future and it's Bounceland UK.The customer service is brilliant and the packages are excellent value for money. It was definitely the bouncy castle and soft play that made my little boys birthday.Very highly recommended and definitely a repeat customer. Thank you very much Bounceland UK. One of the best companies to deal with on a business level .. The service and reliability is second to none. Use this company if you want a first class service. Fantastic service provided, can't recommend highly enough!! JonJo and his team arrived at the time agreed, everything was set up quickly and the equipment provided was of an excellent quality. Pack up was again prompt and efficient. My little boy had an absolute blast at his birthday party and we'll definitely use Bounceland again. Thanks JonJo! 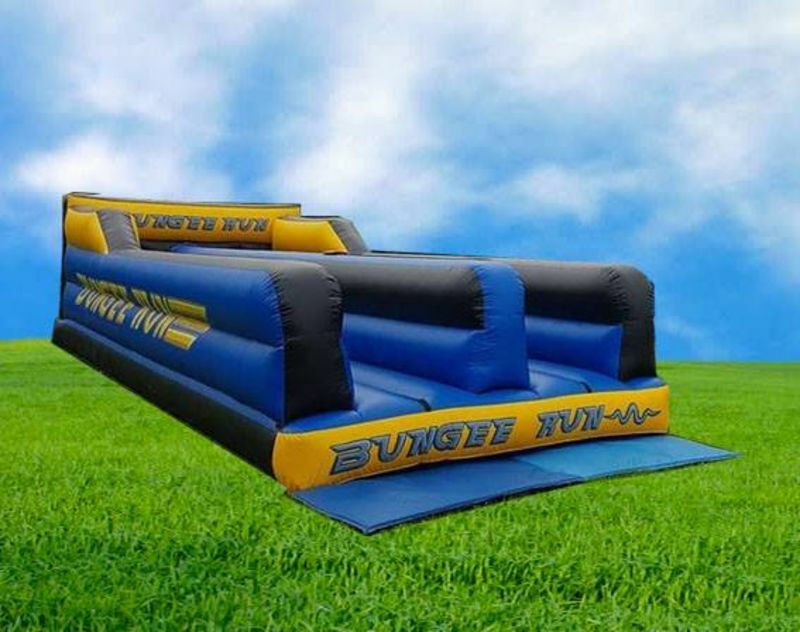 Let's get ready to BUNGEE !!!!!!!!!!! The aim of the game? Let the fun begin as two contestants run against each other attached to a bungee cord which attaches to a belt around the contestants waist, As they run down the runway, the participants try to place velcro markers at the furthest point possible, before the elastic takes over and pulls you back down the inflatable track. Good access is required due to the size and weight of this inflatable it will not go through a house.